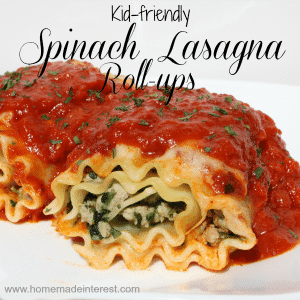 Kid-friendly Spinach Lasagna Roll-ups - Home. Made. Interest. These kid-friendly Spinach Lasagna Roll-ups make getting your kids to eat their vegetables a little easier. I don’t know how it is at your house but getting my 4 year-old to eat his vegetables, much less try new ones, is no easy task. I’m not against using a few tricks to slip some healthy veggies in unnoticed though! One of his favorite meals is my kid-friendly spinach lasagna roll-ups. We call them his super-hero lasagna, because the green stuff in them will give him big muscles like his favorite superhero! It tastes so good he never even asks what that green stuff is ;). The recipe is simple and it can be made ahead of time and frozen individually so you can warm it up for a quick dinner on those nights when you just don’t have a lot of time to cook. All you need to do is brown some ground turkey (chicken or beef works too!) and mix it with a bag of Birds Eye Lightly Sauced Creamed Spinach. I love the Birds Eye Steamfresh® bags because it means I don’t have to wash an extra dish! 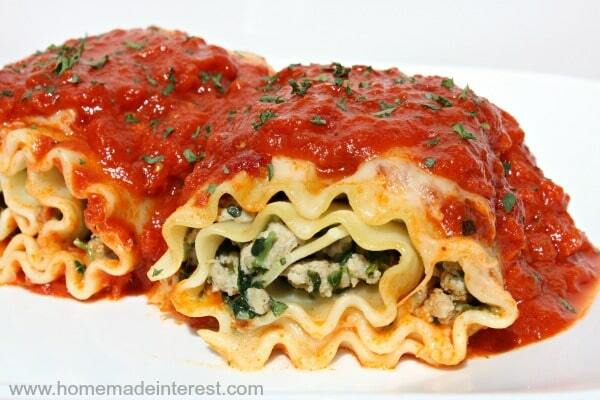 Spread the mixture onto cooked lasagna noodles and roll them up. Then place them in a casserole dish and cover them with tomato sauce and mozzarella cheese. Bake it in the oven for about 30 minutes and dinner is served. Every time I make this for my family it is a hit. My son doesn’t realize he has just had a big helping of spinach and my toddler loves it too. The best part is that the adults in the house like it just as much as the kids do! We all struggle with getting our kids to eat their vegetables. Today, 9 out of 10 people in the United States do not get the proper amount of vegetables, according to The State Of The Plate report. This year, Birds Eye has partnered with Melissa d’Arabian, celebrity chef, mom of four, and host of FoodNetwork.com’s web series The Picky Eaters Project, to make a difference and help moms with the dinnertime dilemma. For more ideas on how to get your kids to eat their veggies check out some of Melissa d’Arabian’s videos for easy ways to put vegetables on the menu. You already know I use her tip on introducing vegetables to your kids by pairing them with familiar favorites! Lasagna roll-ups made with spinach and ground turkey are a delicious way to add vegetables to your busy weeknight meals. While noodles cook brown the ground turkey adding the salt. 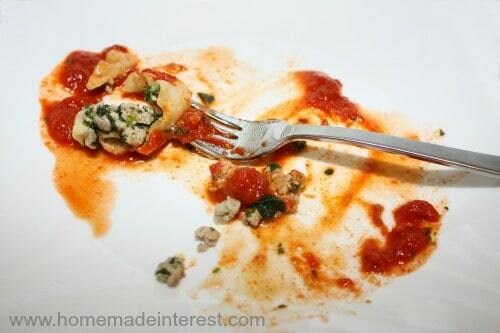 Once noodles are cooked lay them out on a sheet of wax paper and pat them dry. Spoon the turkey mixture onto the noodles and spread it out leaving about an inch of noodle at each end. Place the rolled up noodles in a casserole dish and cover with tomato sauce. 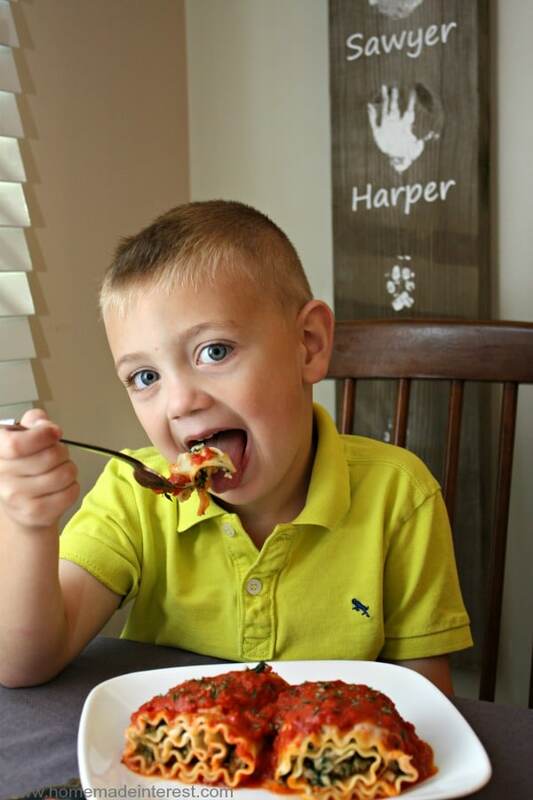 What are some ways you’ve used to get your kids to eat their veggies? My kids would totally eat that! They like spinach anyway. I’ll have to try that to get rid of some of those lasagna noodles in my cabinet! 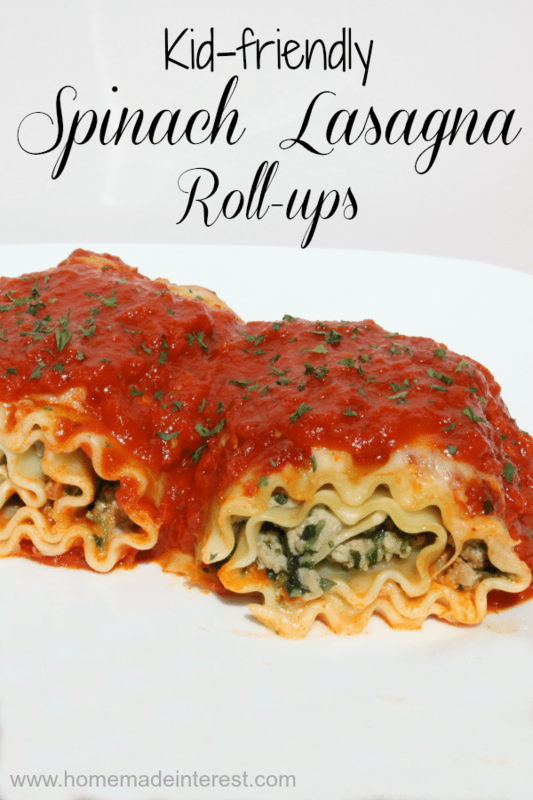 I’ve never made lasagna roll-ups before…..Your tutorial makes it look so easy that I think I’ll give this a try! I love making them for myself with goat cheese….yum!! 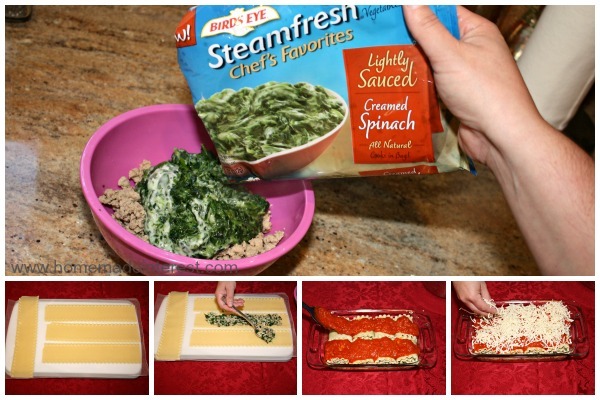 ohhh this kid friendly spinach lasagna roll up recipe sounds and looks so delish! I love sneaking in veggies and bonus for great taste! Thanks for the recipe! Just the recipe I’ve been looking for – thanks so much. I’m hoping my boys love it as much as yours does. I hope they like it too!! It’s one of my favorite veggies, so glad we came up with a way to get the kids to start eating it. Love this Kat! I’m terrible about working the greens into my diet and this is perfect! Now that sounds just like what my gramma use to make. I have a linky for recipes on Friday. Won’t you come over and share your recipe? Have a great weekend. These look delicious and fairly easy to make. I saw them over at the Weekend Retreat Link Party. Thanks for posting them. G’day! One word? YUM! Thanks for sharing at our #SayGdayParty! Oh I must try this and if my son actually likes it, I swear, I might hug you! That child is so picky! My daughter on the other hand is going to love it! I love roll-ups! They are so much easier than regular lasagna to make aren’t they?!?!? These look fabulous! Thanks for linking up with us at #foodie Fridays!!! Great to see you on there as always! Forget the kids, I would be loving that….lol. My 3 year old has entered a fussy phase, but I reckon I could get here to eat this!! Thanks for sharing at Marvelous Monday on Smart Party Planning. This was one of our readers favourite links and will be featured next week! I’m making spinach roll ups later in the week and now I regret not having any ground turkey to the filling. They look delicious. Thanks so much, they are pretty much delicious with anything as filling though. There is just something about roll-ups! I will try making this tonight! The meat doesn’t taste bland with no other seasonings other than salt? Hi Liz, we used the Bird’s Eye creamed spinach for this so we found it had enough seasoning for the rest of the dish with a little added salt. Got it! I will taste it after adding the creamed spinach to see if it needs anything else. If freezing, would I freeze the roll before or after cooking in the oven? I usually cook mine and then freeze them. I freeze them in individual containers, or two to a container, that way I can just warm up the ones I need in the microwave for lunches. Just made this tonight. Yum! My only question is about the cheese. In your picture, I don’t see melted cheese on top. Did you add additional sauce after cooking? Hi Lonna, I’m so glad you liked this recipe. These pics were taken way back when we first started blogging so they aren’t the best :). Looks like we added more sauce on top, probably for photos, but it isn’t necessary!